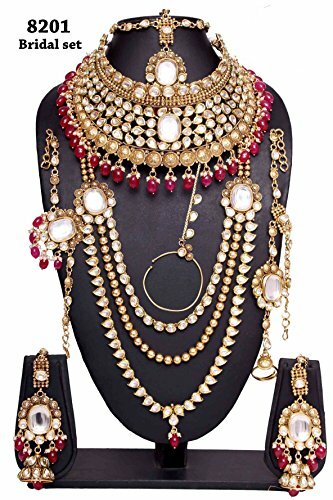 Indian Full Bridal Necklace Set with Matching Pair of Earrings ,Nath, Tikka-Mathapatti, Hathfull & Matching Earrings It is crafted through finest & exclusive raw material, A designer Bridal Necklace set that make you feel royal. This set can be worn on any special occasion. The color complement all outfits & may worn as a statement piece to any occasions. You will feel comfortable when wearing it. Also, jewelry made by Alloy metal has light weight and skin friendly.Stylish and Fashion bangles from the house of Shiv_Collection, perfect for all occasions .They can also wear it on regular basics. If you have any questions about this product by Shiv_Collection, contact us by completing and submitting the form below. If you are looking for a specif part number, please include it with your message.